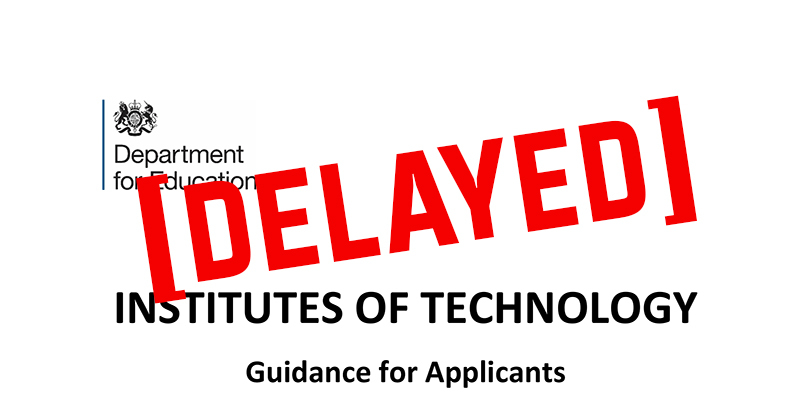 The Institutes of Technology tender has fallen behind schedule, with the final 16 providers left waiting to be told if they have been successful. The Department for Education released the final stage two of the £170 million competition in October last year, and said it expected to announce the outcome in March 2019. But FE Week contacted a number of the shortlisted colleges, who told this publication they have not heard anything as of yesterday afternoon. Uxbridge College, York College and Dudley College confirmed they have not been given any indication to whether their proposals have been the successful. FE Week has also contacted the DfE to find out the reason of yet another delay. In May last year, this publication reported the competition was falling behind schedule, with providers who applied to open one IoT not knowing if they had been successful. IoTs, which were first mooted back in 2015, are intended to bring together FE and HE providers along with employers to deliver technical skills training, with a particular focus on levels four and five. Between 10 and 15 of the institutes are expected to be created. In December 2017 the Department for Education said: ” We expect the first IoTs will be open in 2019”.